A Huge ‘Thank you’ to all those visiting our open days last weekend. We had a really wonderful weekend and had some fantastic feedback, both about our care facilities and the quality of the plants and produce we have available. If you haven’t visited us already, please do so. We’re now open 7 days a week. 9.30-4 Monday to Friday and 10 – 3 Saturday and Sunday. 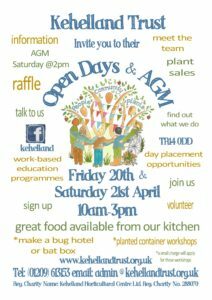 Please join us for our Open Days! We have chosen to run over two days so that you can come along and see Kehelland as a working site, not just as a weekend day out. 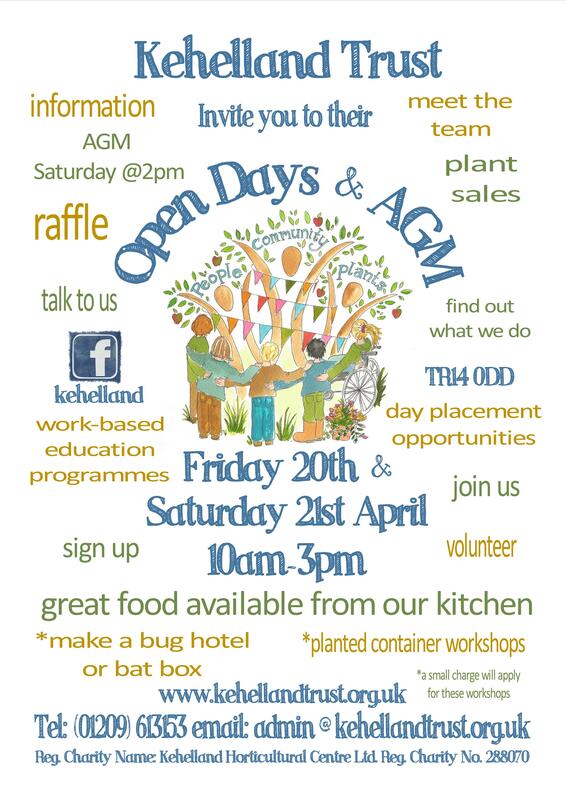 Meet our staff, trainees, students and volunteers and find out all about Kehelland Trust and the work that we do. There will be a plant tombola, food available from our kitchen and workshops you can participate in such as making a herb planter or a bug box. If you need any more information please call us on (01209) 613153 or keep an eye on our Facebook ‘Events’ page.